Except for Bangkok, Chiang Mai, with more than 700, has the greatest concentration of exquisitely crafted wats, or temples, in the country. If you start in the early morning, you can see all of the principal sights in one day, particularly if you travel by tuk-tuk. There are so many tour groups in Chiang Mai that specialize in trekking, that it can seem impossible to choose. Most of the smaller operators have offices along Tha Pae Road, in guest houses, and all along the major tourist routes in the city. You might like to talk to some of them for yourself to see if they have anything you might be interested in. Many adventure tours mix mountain biking or motorcycling with tribal village tours. Superhighway, just north of the seven-spired Wat Chet Yot. Phone: 053/221308 . Open: Wed-Sun 9am-4pm. Closed holidays. Admission 20B . The gentle but penetrating Thai massage, thought to have developed as a healing tool more than 2,000 years ago, is still widely practiced throughout Thailand. Many urban hotels now offer traditional massage (as opposed to physical or sexual massage), but nowhere is it as widely promoted than in Chiang Mai, and the "Old Medicine Hospital" is the largest center for therapy and study. An 11-day massage course conducted in English, which meets 9am to 4pm daily, is available twice a month (except for the first two weeks in April) and costs about 2,500B. A "tourist pleaser" massage lasts one hour, but the traditional Thai method takes at least two hours. There are also Finnish, Western, and Thai herbal saunas. Your daytime massage can be combined with a visit to the Lanna Folk Museum, and your nighttime one with a khan-toke dinner. Open: Daily 8:30am-4:30pm. 200B for one-hour massage. Please contact your travel agent. If you plan to go trekking or have any interest in the hill-tribe people, visit this facility. The institute conducts research, publishes excellent books and brochures, coordinates trekking groups, and runs a small, informative museum devoted to the ethnographic legacy of the northern tribal groups. There's an informative library next door. Chiang Mai University, 4 km (2.4 miles) west of the Old City, off Huai Kaeo Rd.. Phone: 053/221332 . Open: Mon-Fri 8:30am-noon and 1-4:30pm. Free admission. Because it's near the Tha Pae Gate, most visitors begin their sightseeing at Wat Chedi Luang, where there are two wats of interest. This complex, which briefly housed the Emerald Buddha now at Bangkok's Wat Phra Kaeo, dates from 1411 when the original chedi was built by King Saen Muang Ma. The already-massive edifice was expanded to 280 feet in height in the mid-1400s, only to be ruined by a severe earthquake in 1545, just 11 years before Chiang Mai fell to the Burmese. (It was never rebuilt.) A Buddha still graces its exterior, and it's not unusual to spot a saffron-robed monk bowing to it as he circles the chedi. The remarkable nagas (serpents) guarding the stairway entrance to the typical northern viharn are exceptionally ornate and ferocious. Next to the tall gum tree on the left as you enter the compound is the shrine honoring Sao Inthakhin, also referred to as the city's pillar. It's believed that the upkeep of this wat is directly related to the well-being of Chiang Mai. During festivals, young girls often sell small sparrows trapped in rattan cages for 20B; setting them free gains merit for the liberator. Prapokklao Rd.. (south of Ratchadamnoen Rd.). Open: Daily 6am-5pm. Suggested contribution 10B. Wat Chet Yot (also called Wat Maha Photharam) is one of the central city's most elegant sites. The chedi was built during the reign of King Tilokkarat in the late 15th century (his remains are in one of the smaller chedis), and in 1477 the World Sangkayana convened here to revise the doctrines of the Buddha. The unusual design of the main rectangular chedi with seven peaks was copied from the Maha Bodhi Temple in Bodh Gaya, India, where the Buddha first achieved enlightenment. The temple also has architectural elements of Burmese, Chinese Yuan, and Ming influence. The extraordinary proportions, the angelic, levitating devata figures carved into the base of the chedi, and the juxtaposition of the other buildings make Wat Chet Yot (Seven Spires) a masterpiece. The Lanna-style Buddha hidden in the center was sculpted in the mid-15th century; a door inside the niche containing the Buddha leads to the roof on which rests the Phra Kaen Chan (Sandalwood Buddha). There is a nice vista from up top, but only men are allowed to ascend the stairs. Superhighway, near the Chiang Mai National Museum. Open: Daily 6am-6pm. Suggested contribution 10B. North of the intersection of Nimanhemin and Huai Kaeo rds., about half a mile, on the left. Thought to be Chiang Mai's oldest wat, it was built during the 14th century by King Mengrai, the founder of Chiang Mai, on the spot where he first camped. Like many of the wats in Chiang Mai, this complex reflects many architectural styles. Some of the structures are pure Lanna. Others show influences from as far away as Sri Lanka; notice the typical row of elephant supports. Wat Chiang Man is most famous for its two Buddhas: Phra Sritang Khamani (a miniature crystal image also known as the White Emerald Buddha) and the marble Phra Sri-la Buddha. Unfortunately, the wihaan that safeguards these religious sculptures is almost always closed. Wiang Kaeo and Ratchaphakkinai rds.. (in the Old City near the northern Chang Puak Gate). Open: Open daily 6am-5pm. suggested contribution 10B. This compound was built during the zenith of Chiang Mai's power, and is one of the more venerated shrines in the city. It's still the site of many important religious ceremonies, particularly during the Songkran Festival. More than 700 monks study here, and you will probably find them especially friendly and curious. King Phayu, of Mengrai lineage, built the chedi in 1345, principally to house the cremated remains of King Kamfu, his father. As you enter the grounds, head to the right toward the 14th-century library. Notice the graceful carving and the characteristic roof line with four separate elevations. The sculptural devata (Buddhist spirits) figures, in both dancing and meditative poses, are thought to have been made during King Muang Kaeo's reign in the early 16th century. They decorate a stone base designed to keep the fragile sa (mulberry bark) manuscripts elevated from flooding and vermin. On the other side of the temple complex is the 200-year-old Lai Kham ("Gilded Hall") wihaan, housing the venerated image of the Phra Singh or Sighing Buddha, brought to the site by King Muang Ma in 1400. The original Buddha's head was stolen in 1922, but the reproduction in its place doesn't diminish the homage paid to this figure during Songkran. Inside are frescoes illustrating the stories of Sang Thong (the Golden Prince of the Conchshell) and Suwannahong. These images convey a great deal about the religious, civil, and military life of 19th-century Chiang Mai during King Mahotraprathet's reign. Samlarn Rd. and Ratchadamnoen Rd.. Open: Daily 6am-5pm. Suggested contribution 10B. We like this complex less for its architecture (the buildings, though monumental, are undistinguished) than for its contemplative spirit and pleasant surroundings. The temple was built amid the pleasure gardens of the 14th-century Lanna Thai monarch, King Ku Na. Unlike most of Chiang Mai's other wats (more tourist sights than working temples and schools), Wat Suan Dok houses quite a few monks who seem to have isolated themselves from the distractions of the outside world. Among the main attractions in the complex are the bot, with a very impressive Chiang Saen Buddha (one of the largest bronzes in the north) dating from 1504 and some garish murals; the chedi, built to hold a relic of the Buddha; and a royal cemetery with some splendid shrines. Suthep Rd.. Open: Daily 6am-5pm. Suggested contribution 10. From the Old City, take the Suan Dok Gate and continue one mile west. While Chiangmai itself is the biggest jewel in the crown from the visitors point of view, there are other gems all around and within easy reach that shoul not be ignored. CHIANGRAI: 180 kms. To the northwest of Chiangmai, has been growing recently, but still shows evidence of its lengthy past, predating the Northern Capital as its foundation does. The easiest approaches are by air and road, but the four-hous boat trip from Ta Thon down the Mae Kok River gives the best introduction. The so-called Golden Triangle meeting point of the Thai, Lao, and Burmese borders can claim to the most famous tourist destination, but its rival is the Doi Tung Development Project. 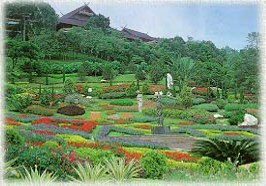 Situated on the Reclining Lady Mountain near the Burmese border and initiated under Royal patronage, Doi Tung has become one of the Norths biggest tourist attractions. Different ethnic groups working there produce handicrafts that are known world-wide, and naturelovers are drawn from far and near to the Mae Fah Lung Arboretum, with its extraordinary diversity of flora. The project also offers accommodation of the highest quality. MAE HONG SORN: On the Burmese border to the west is particularly attractive. Known as The City of the Three Mists, it can be reached in half an hour by plane, though those with the time may find driving round on the excellent highway a good introduction to the forest-covered mountains surrounding it. Home to most of Thailands colourful hill peoples the Pa Dong women with their elongated ringed necks (Long Neck women) the most spectacularly different in appearance it offeres the adventurous and energetic hot-springs, caves and waterfalls as near or farther destinations. Rafting on the Pai River is particularly recommended. But the small provincial town, with its morning markets and colourful festivals. LAMPANG: The trip one hundred kilometres down the super-highway to Lampang takes you back to a quieter, slower-moving era, symbolised by the horse-carriage Taxis clip-clopping through the streets there. Lampangs mascott is the White Rooster image standing at the City Gate. Townspeople say that during one of the Buddhas legendary visits to the North, the King of the Gods, Indra, concerned that people might not wake in time to welcome the Great Being, took the form of the bird and crowed his warning. Apart from its many historic temples, Lampang is also famous for its handicrafts and fruit production. Its elephant training centre and hospital, 38 kms. out of the city, is well worth visiting and has a programme that allows you to see the great beasts at the their best.